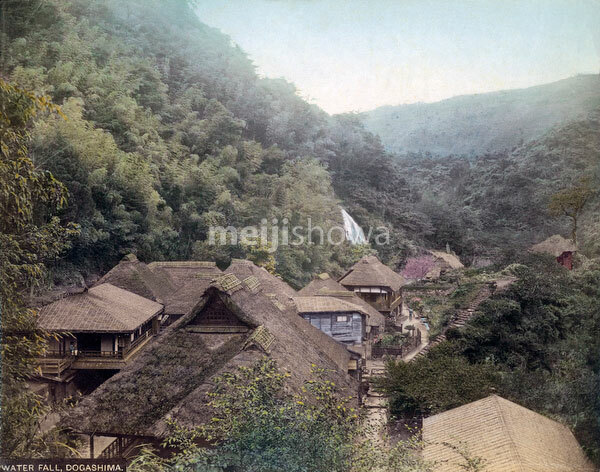 Japanese inns with thatched roofs at Dogashima Onsen in Hakone, Kanagawa Prefecture, sometime before before 1887 (Meiji 20). In the back, Shirabe Falls can be seen. Starting from the large building on the left the inns are Omiya, Yamatoya, Maruya, Edoya and Naraya. The small building on the hill is Yamaiyama. The Sodium chloride hot spring of Dogashima was one of the “seven hot springs of Hakone” (Hakone Nanayu). The others were Yumoto, Tonosawa, Miyanoshita, Sokokura, Kiga, and Ashinoyu. Also see 80128-0002 – Dogashima Spa.